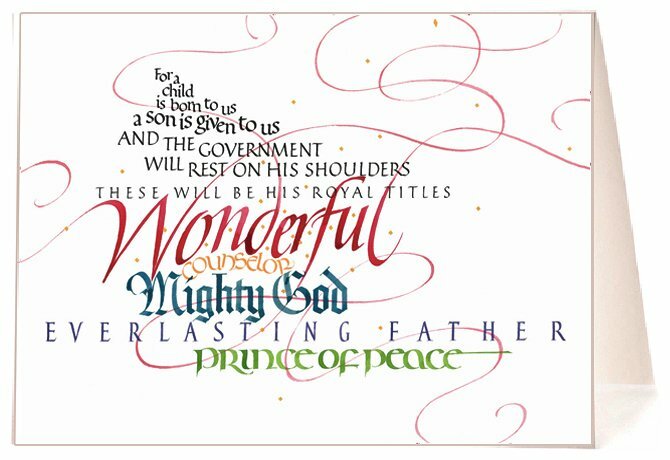 This famous prophecy from Isaiah, beautifully interpreted through Tim's expressive calligraphy, wonderfully embodies the spirit of Christmas. "First off, it's amazing that this prophecy in Isaiah 9:6 came seven centuries before Jesus" advent. 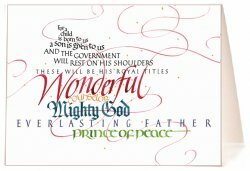 These five royal titles for the Messiah illustrate the breadth of His character. So my aim was to show that multi-dimensional aspect with the various styles and colors of lettering. The Apostle Pul's description of Jesus comes to mind as the "All in All." - Inside Copy: "Good tidings of great joy to you and yours this Christmas season!"